I think most people would agree immersion is the best way to learn a language. Unfortunately, that can often be difficult to pull off, even if you live in the country with the language you’re trying to learn. Immersion in China can be even trickier, where both difficulties with the language and the culture can be difficult barriers to surmount. After a three-month stay in China, I’m hardly an expert on learning Chinese. However I did go from a minimal amount of prior self-study (105 hours, exactly), to passing the HSK 4 and being able to hold fairly complex conversations in Chinese after my brief stay. At the risk of sounding immodest, I believe immersion was the key to my progress and I believe it’s the biggest component most new learners in China lack which holds them back. In this article, I want to spell out exactly what steps I took to create a sustainable immersive environment to improve my Chinese over a short stay. One of the most important factors is that I aimed for an immersive environment, from the first day in China. Given I was barely able to make up a sentence and couldn’t understand anything Chinese people were saying to me, that might sound too difficult to replicate. However, I believe it is possible to create an immersive environment from the first day, even if you aren’t enrolled in one of those fancy boarding schools which force you to speak Chinese. Second, I believe this step is one of the most important you can take for your overall rate of improvement. Chinese isn’t my first foreign language I’ve learned. That was French. I lived in France for a year during my senior year of university. Despite four years of grade school classes, my French was nonexistent. I had always wanted to learn a foreign language, so getting an opportunity to live abroad was the perfect time to do that. I’m still mostly the same person I was four years ago. Certainly any innate talent for learning languages, if such a thing exists, would have been the same then as it is now. My motivation for learning French was at least as strong as learning Chinese. So why did I fail to do what I have done in Chinese with an “easy” language like French? I believe the difference was immersion. Although I was living in France to learn French, most of my friends were other foreigners who spoke English. Even the French friends I had tended to speak in English with me because we were part of an English speaking group. By the time I had realized my mistake, it had become very hard to change course. The only way I could start an immersive environment now would have been to cut off all my non-French speaking friends and force myself to speak in an unfamiliar language with people who were used to me speaking to them in English. After this experience, I resolved to do things differently next time. So when I came to learn Chinese, I wanted to make sure I was building an immersive environment from Day 1. Immersion sounds great, but it’s definitely easier said than done. I believe that managing the development of your environment while living in China can be trickier than learning Chinese, and it’s very easy to get into some bad habits (or friendships) that will hold you back. The most direct step I took was simply not speaking in English. The no-English rule is not possible to perfectly implement (at least for mere mortals like myself). I had to speak in English when I arrived to the landlord. I had to use English in some brief moments to coordinate with possible tutors. I had to use English with Vat, my friend who I traveled with and shot the documentary you can see at the top of this article, as he hadn’t done the same amount of prior preparation as myself. Forming friendships with people who can’t or won’t speak Chinese. Beginning friendships with Chinese people who want to use you to practice their English. Using a bit of initial isolation to motivate yourself to learn Chinese and make Chinese friends. This is an intense strategy, so you might be wondering whether it’s something you can successfully execute. I’ve done this now with Chinese, Spanish, Portuguese and I’m currently in the beginning phases of applying it with Korean. While it can be very intense, I want to stress that the intensity is mostly temporary. Chinese may take a little longer to break in than a European language, but you will break through, and when you do, you’ll be in the immersive environment you need to make rapid improvements in your Chinese. What happens if you fail? Don’t worry, pick yourself up and try again. The goal isn’t perfection, simply enough commitment to using Chinese that you get the three benefits I listed above. Simply not speaking in English is rather vague, so I want to add some concrete examples of steps I found useful, both in China, and in other countries where I’ve applied this technique. 1. Make friends with your tutor and ask him or her to introduce you to new friends. China can be a hard country to befriend strangers when your ability with the language is quite low. It wasn’t until the third month that I found myself starting to make friends randomly, as before my Chinese was too limited to have more than basic chit-chat. My strategy in China was to actually get a couple tutors around the same age as myself (I ended up settling on two), who I could have lessons with. From the day I first met them, I mentioned that I was interested in meeting other Chinese people, so I tried to pick tutors who could introduce me to other Chinese speaking people. That strategy is a bit slow, and it took me two weeks before I was getting introductions, but it ended up resulting in dozens of new friends, all in Chinese. 2. Get a home-base restaurant and talk to the staff. This is a good one in China because restaurants are so cheap and numerous, but I’ve used it in all of the countries I applied this method, so I believe it is easily replicable. Basically, find a place where you (a) like the food enough to eat there everyday and (b) the owner or staff is very friendly and chatty with you. Even if you can’t have great conversations with them yet, this can be a good first friendship in the language because you will see them often enough that there is no need for complex introductions or swapping of contact details. 3. 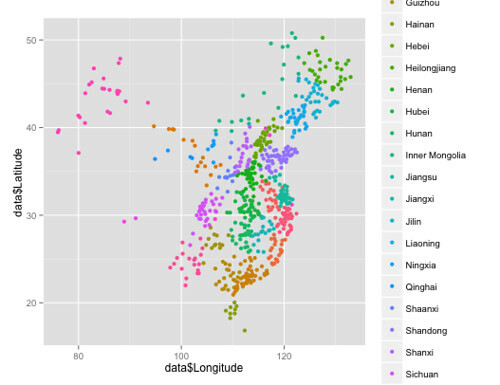 Go to language meetups, once you’ve successfully had all-Chinese tutoring sessions. I like language exchanges for making friends in the language. But these can be a trap in China, where everyone just practices English on the largely non-Chinese speaking foreign population. The problem isn’t that Chinese people won’t speak in Chinese with you. Just the opposite, I’ve found most Chinese people like talking to foreigners, and are quite happy when they don’t have to use their English (even in language meetups). Most people I’ve met have been quite patient with me as I’ve stuttered out broken sentences. The problem is that, if you haven’t successfully had a conversation with one of your tutors entirely in Chinese (or at least mostly in Chinese, where you weren’t constantly switching back to full English sentences), it is easy to get sucked into the English speaking groups. You might have a job in China where you need to speak English, so fully avoiding the problems I mentioned are out of the question. However, the same steps can be applied privately to start surrounding yourself in a Chinese-speaking social circle, so that you can at least get the benefits of partial immersion. Immersion is an intense strategy, but it’s also one you must design. Unfortunately, many first-timers believe it is guaranteed by living in the country and then lament at the difficulty of learning Chinese when they’ve made little progress despite years in China. The intensity may be uncomfortable for the first month or two, but that’s a one-time cost. Once you reach an intermediate level of Chinese, continuing to improve by making new Chinese-speaking friends gets easier and easier. Averaged out over years, I believe immersion actually takes less effort than constant amount of Chinese study within an English-speaking bubble, it just happens to compress most of that effort in the first bit. Scott Young is a blogger, traveler and author of Learn More, Study Less (recently published in Chinese). If you join his newsletter, you can get a free ebook detailing the strategy he uses to learn faster. The following is a guest post by “Prince Roy.” If you’ve been following the blogosphere for a long, long time, you might recognize the name and remember his China blog, which was hosted on the (now defunct) Sinosplice blogging network. 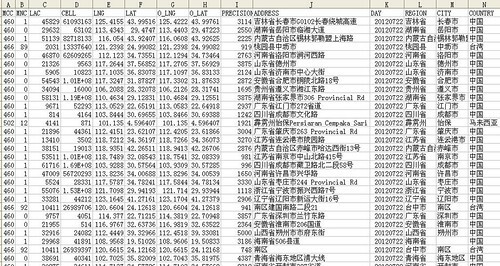 He also wrote the guest article Integrated Chinese (Levels 1, 2): A View From the Trenches on Sinosplice as well. In this post he’s going to share his personal experiences learning Vietnamese in preparation for being stationed there by the U.S. State Department, after having already learned Mandarin Chinese years ago to an advanced level. When John asked me to comment on my experiences learning Vietnamese and Chinese, I was happy to oblige, because it allows me to try and wrap my head around what I’ve been through since I began studying Vietnamese last September (8 ½ months ago now). In the interests of full disclosure, I studied Chinese for a total of five years, and have spoken it now almost 25 years. This is the big one. It is hard to imagine two sound systems more diametrically opposed than English and Vietnamese. Every aspect of Vietnamese phonology is hard. Vietnamese has single, double and even triple vowels. Few of them are remotely similar to English, and just the slightest mispronunciation will result in an unintended vowel. This, compounded with the tones, can easily render one’s speech unintelligible or worse. The pronunciation of a consonant can change depending on whether it occurs at the beginning or end of a word. There is a multitude of nasal and glottal sounds that don’t exist in English or Mandarin. In southern Vietnamese, the dialect I am learning, people often pronounce ‘v’ as ‘y’—to add to the confusion, ‘d’ and ‘gi’ are also pronounced as a ‘y’ sound’. The consonant pair that has given me the most difficulty is t/đ (different from the ‘d’ above). In normal speed speech, I cannot distinguish them; in the language lab only if I listen very closely. Here’s a real-life example of why this is so critical: a very common dish in Vietnam is phở bò tái—rare beef pho. But when I pronounce this in Vietnamese, my teachers say they hear ‘phở bò đái’, literally ‘cow piss pho’. Oops. Umm…waiter? In short, I’ve found Chinese phonology presents much less difficulty than Vietnamese. Like Chinese, Vietnamese is tonal, but the similarity ends there. 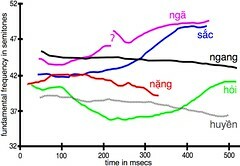 The northern (Hanoi) dialect has 6 tones; the southern (Saigon) has 5. Thankfully, I’m learning the Saigon dialect, because that extra tone of the Hanoi dialect is a ‘creaky’ tone which has the effect to my ears like nails on chalkboard. I had hoped my experience with Chinese would prove beneficial—the tones in Mandarin always seemed somewhat intuitive to me, even from when I first began to study the language. Not to say I am completely error free, but tones were never problematic for me to the degree they often are for other students. Having spoken Chinese for so many years, I plead guilty to tonal transfer, but in my own defense, tones in Vietnamese are more subtle, and for me, not nearly as intuitive. Two that give me a lot of trouble are the dấu huyền and dấu nặng tones (low-falling and low-dropping), particularly when occurring consecutively and spoken at conversational speed. Also, the dấu sắc (high-rising) tone is tough for me, because I tend to produce it like the second tone of Mandarin, which is wrong. However, tones are the least of my worries in Vietnamese; I think they will come more naturally after I arrive in Vietnam this August. And at least my teachers tell me I sound tonal when I speak, albeit with a somewhat pronounced Chinese accent. 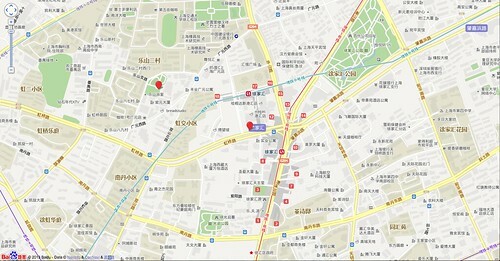 Vietnamese, like Chinese and English, is an SVO language. But that is its only concession. Vietnamese grammar is the most difficult aspect of the language after pronunciation. Similar to Chinese, sentence particles are a very important grammatical component, but Vietnamese takes this to a stratospheric level of complexity. I also believe Chinese is more flexible than Vietnamese—in the former, once you learn a particular sentence pattern, you can pretty much plug anything into it, and while it might not be the way a native speaker would say it, they will often understand you. Not so in Vietnamese. Phrase memorization is more useful than patterns, because if you don’t say it exactly like a Vietnamese does, you will usually encounter a blank expression on the face of your listener. Another characteristic of Vietnamese is it boasts an extraordinary number of synonyms. Chinese is rich in synonyms too, of course, but the difference is that in Chinese, you might commonly encounter two to three of them in typical popular usage. In Vietnamese, it seems people like to use all of them. Vietnamese is indeed a very rich, complex language—in fact my classmates and I have an inside joke: Tiếng Việt rất phong phú (Vietnamese is a very rich language) = Vietnamese is really, really hard. But there is an upside for those with a Chinese background when learning Vietnamese. Due to the roughly 1000-year period that Vietnam was a colony of China, Chinese had an enormous influence on the Vietnamese language. I can determine a Chinese cognate in up to 60% of the vocabulary I’ve learned to this point. Its close relationship with Chinese is both a blessing and a curse, however. A blessing, because I can often correctly guess the meaning of words when I encounter them in a text, and a curse because that close relationship makes it harder for me to take Vietnamese on its own terms—and this language, like its people, is fiercely proud and independent. I feel as though I am treading water in Vietnamese, and my facility in Chinese allows me to, just barely, keep my nostrils above the water. That’s why I’m in awe of those among my classmates who are making good progress in Vietnamese without the benefit of Chinese. It makes their achievement all the more amazing.